Rabbit Wine Bottle Opener | Uncork Wine Bottles with Ease | Stylish Ergonomic Design, Spiral Corkscrew with Foil Cutter | Luxurious Black Gift Box Set | The Ultimate Kitchen and Bar Utensil, by Vino Culto at Verve Wine Bar. Hurry! Limited time offer. Offer valid only while supplies last. Feel like finding the perfect wine bottle opener is like looking for the holy grail? How many wine bottle openers have you owned in your lifetime? Feel like finding the perfect wine bottle opener is like looking for the holy grail? How many wine bottle openers have you owned in your lifetime? Like most people you've tried them all. They can be frustrating to use easily break or don't last long. So we've found the perfect wine bottle opener for you. OPEN WINE BOTTLES WITH EASY - The Vino Culto Rabbit Wine Opener is a breeze to use. Its ergonomic design fits perfectly in your hand and provides you the power to extract even the most stubborn corks with minimal effort. That means you and your guests can get to your wine sooner! PROFESSIONAL - You'll look like a pro popping corks at the bar, the table or in the kitchen on that special holiday or any day. Our elegant and classy design makes a statement. This stylish bottle opener is the perfect complement to any party, wine cellar, cabinet, rack, bar or dining room. Professional grade and used by aficionados and sommeliers worldwide -now you know their secret! THE PERFECT POUR No more embarrassment! Tired of corkscrews that don't extract the full cork? That won't happen now! Our sharp screw penetrates the cork firmly, minimizing unnecessary damage to the cork. Your wine remains FREE of any broken cork bits which can spoil its taste. ERGONOMIC FOR GREATER LEVERAGE - An ergonomic lever design contours around the natural curve of your hand to make this opener one of the most user-friendly available. You'll get maximum leverage to extract any cork with more control and less effort. Ideal for those suffering from arthritis in their hands and seniors with reduced grip. Simple instructions are included to master its use. PERFECT GIFT - This stylish 3-piece gift box is perfect for wine lovers, your boss, bride and groom, wedding anniversaries or birthdays. SATISFACTION GUARANTEE - Backed by a 1-year warranty. 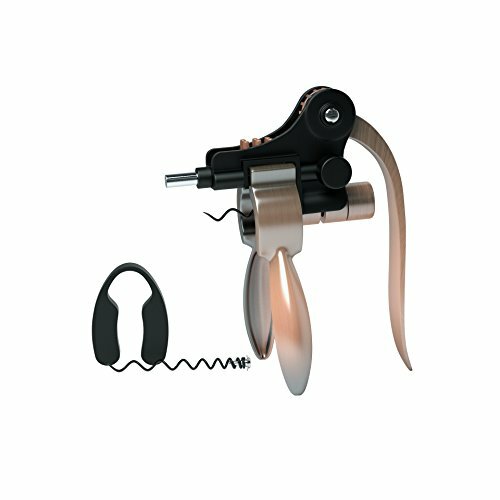 PROFESSIONAL GRADE RABBIT WINE OPENER - You will look like a pro popping corks at the bar, the table or in the kitchen. Our stylish and classy design makes a statement. Used by wine experts and sommeliers the world over -now you know their secret! THE PERFECT POUR. NO MORE BROKEN CORKS - Tired of corkscrews that don't extract the whole cork leaving you with broken pieces? Our sharp corkscrew penetrates the cork firmly and uncorks fully -setting you up for the prefect pour with only 1 pull. If you have any questions about this product by Vino Culto, contact us by completing and submitting the form below. If you are looking for a specif part number, please include it with your message.